There haven't been many photos of Svejk in this blog so far, so here's a recent one of him exploring the house. All of the regular possums are still visiting. Wesley was absent for over a week and we thought he might have left the area, but he returned last night. Grendel left her sleeping place under the eaves a couple of weeks ago and has not been seen since. She might have moved further up into the ceiling space for warmth - the weather has been quite cold - or might have left the area for a while. There have been some more ringtails about. 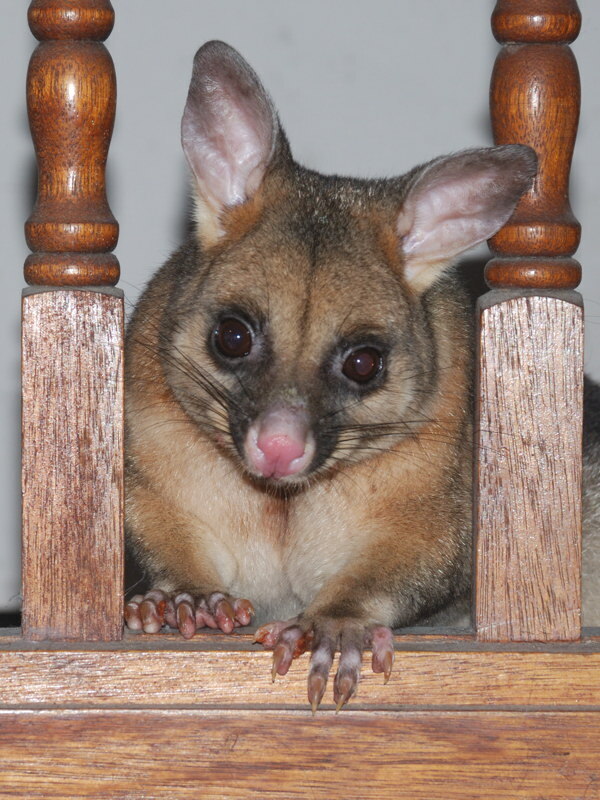 There was a mother and two babies, and at one stage a small ringtail was seen on the balcony rail. Possibly, the presence of the ringtails indicates that Grendel has moved on. About a week ago, Marlon managed to get a claw torn off. 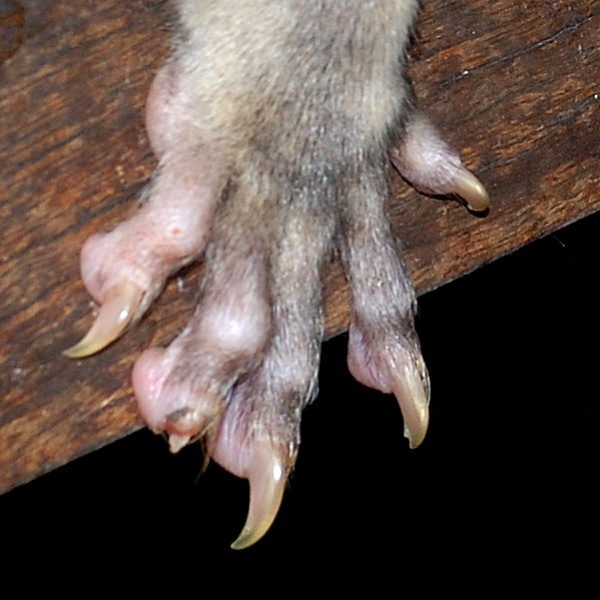 It must have really hurt, but possums tend to conceal their injuries to avoid attracting the attention of predators, and we didn't notice the problem until we inspected the photo afterwards. It looks like there has been no infection and the claw is growing back fairly rapidly. Kiki's baby has grown large enough to be quite an encumbrance to her. 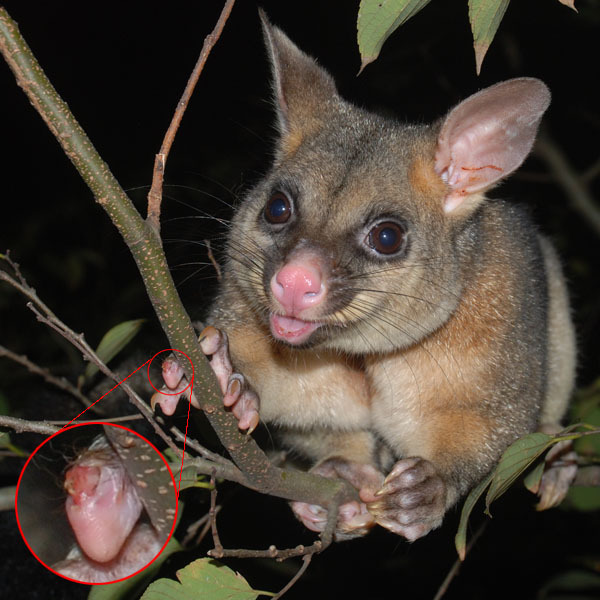 We haven't seen it outside of the pouch yet; the only glimpse we've had of it so far are of a grabbing hand extending out of the pouch and this photo showing the tail. 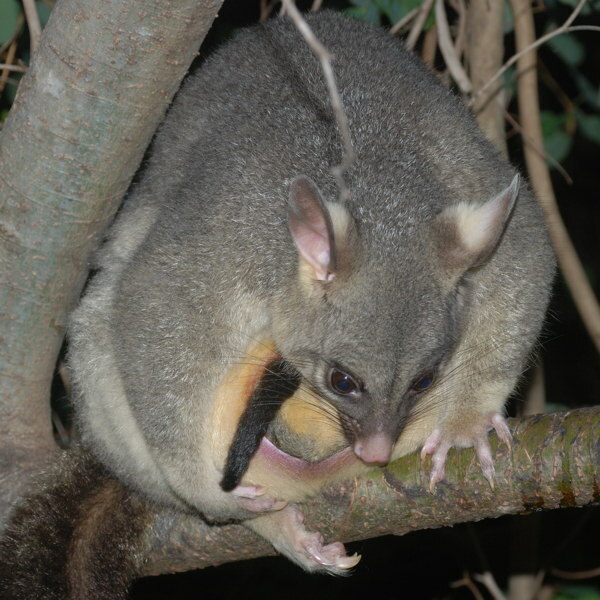 It's a pity that Kiki never uses any of the nest boxes because the baby would be coming out the pouch to explore during the day.